M.C. 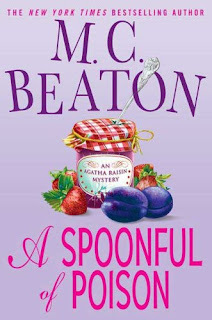 Beaton 's Agatha Raisin series is my absolute FAVORITE cozy mystery series out there! I love it for so many reasons I probably couldn't name in one go here in this review. If ever you need a pick-me-up or you're in a book slump, an Agatha Raisin book is guaranteed to make you happy. Plus, they're quick, fast reads you could probably finish in one sitting on a rainy Sunday. A Spoonful of Poison is the nineteenth book in the Agatha Raisin series featuring the ensemble cast we have grown to love including the vicar's wife Mrs. Bloxby, detective Bill Wong, the annoying scumbag Sir Charles Fraith, and newcomer Toni Gilmour, Agatha Raisin's young, beautiful and intelligent sidekick. This time, Agatha Raisin organizes a church fundraiser around a jam-tasting festival. When some of the taste-testers begin to act crazy and a murder is committed, Agatha Raisin must investigate along with her detective crew who poisoned the jam with what, and why. Agatha Raisin is just so blunt and up-front with everybody to the point of hilarity, as Agatha isn't exactly prim and proper, but at times extremely rude and biased. She always allows her hormones to guide her in the wrong direction, which is also comical when the handsome gentlemen who are featured from novel to novel don't reciprocate the same romantic feelings toward Agatha. Toni is such a welcome breath of fresh air to the series because we want her and Agatha to get along and see a bit of Agatha's mothering side to come out, but although it doesn't fully happen in A Spoonful of Poison , I'm hoping with further character development we'll see it come through more in future novels. With cozy mystery series such as these, the enjoyment comes not so much from the mystery itself, but more from the characters we've come to love and be comfortable with throughout all nineteen books! It's so entertaining to watch the characters grow, develop and interact with one another. The mystery portion is totally irrelevant; it's the ride itself that you grow to love with Agatha Raisin and company. The first few books in the series are Agatha Raisin and the Quiche of Death (1992), Agatha Raisin and the Vicious Vet (1993), and Agatha Raisin and the Potted Gardener (1994). I'm eagerly looking forward to reading There Goes the Bride (2009), the twentieth book in the series.